Rybka addresses the packed crowd. 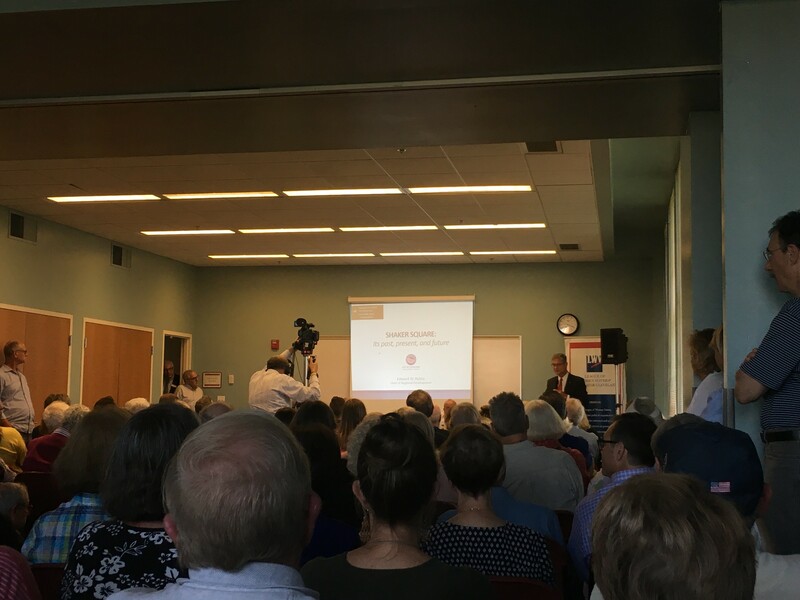 Tuesday night, community members crammed into an upstairs room at the Shaker Heights Library to attend a forum on the future of Shaker Square. The event was organized by the library and the League of Women Voters of Greater Cleveland, and was narrated by jaunty folk music that filtered in through the window. The street festival outside and the forum (one of which was poorly timed) occasionally battled for the crowd's attention. Moderated by The Plain Dealer's art and architecture writer Steven Litt, the forum featured a panel of four community members: EDWINS Leadership & Restaurant Institute founder and mayoral candidate Brandon Chrostowski, Coral Company president Peter Rubin, Cleveland's Chief of Regional Development Edward Rybka and Captain John Sotomayor of Cleveland Police's Fourth District. Chief among the crowd's concerns were how Shaker Square might stand against glitzy new shopping centers in Orange Village (Pinecrest) and Shaker Heights (Van Aken Center), both set to open next year, as well as a declining local population, and security. The panelists declared all of these points to be non-issues, and stressed the neighborhood's importance in the community. Litt opened by calling Shaker Square "one of the anchors that holds Northeast Ohio together" and quoting William Butler Yeats: "If the center cannot hold, things fall apart." "Let me start by saying the obvious: Shaker Square matters," said Litt. 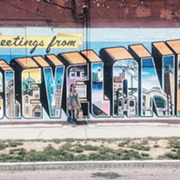 "Even if you never visit Shaker Square and wouldn't even think of going there, it matters." When asked if they'd been to the neighborhood in the last month, however, nearly everyone raised their hands. Security in the area was also a key point of discussion; Sotomayer stressed decreased criminal incidents, down 15 percent from last year and 24 percent districtwide, and a dedicated Cleveland police presence. Rubin, too, praised officers' "incredible" response times and capture rates. While Sotomayer ceded that robberies have increased slightly from last year, he urged people to put things in perspective and recognize that "one incident is just that — one incident." "Shaker is one of the safest areas in the whole city of Cleveland . . . There is no reason to fear going to Shaker Square," said Sotomayer. He did shoot down an audience question about a potential police substation in the Square, which would require too much personnel and funding, but said, "The more you fight for it, it could happen." Mayoral candidate Chrostowski, who lives behind the Square's CVS, professed his affection for the area and declared vague, ambitious plans for its future: "We can definitely make this the best location in the nation." Rubin also emphasized the Square's potential for future improvement. He said that people shouldn't worry about the affect of new shopping centers nearby, namely Pinecrest. "We don't think Pinecrest really will have any impact on the Square," said Rubin. "it's not aimed at the people who frequent [it]." Rubin, whose company owns Shaker Square, noted that while the area's occupancy was just 30 percent when acquired by Coral Company in 2004, it's now 100-percent full — and not just occupied, but "stable and occupied," he stressed. Rubin also highlighted recent additions, such as 24/7 security cameras, new lighting and a mobile app launched last month. Rybka also commended goals achieved by the Square in recent years, such as stabilized neighborhoods, walkability, partnership with adjacent suburbs and demolition of run-down buildings. In the Square's future, said Rubin, is a holistic animal clinic, operated by a husband and wife veterinarian team, and likely a facility called Harvest, which would offer a farmer's market with healthy food and cooking classes for adults and children. 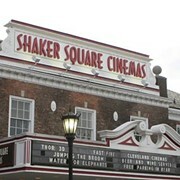 The movie theater at Shaker Square, operated by Cleveland Cinemas, was one of the last points discussed by the panel, and prompted a chorus of "clean it up" from the crowd. "Shaker Square Cinemas has made more money every year, but the rate at which it's growing is decelerating," said Rubin, then promised they were still "committed" to maintaining the theater. To wrap up the evening, several panelists called for community involvement in improving the neighborhood; Rubin called specifically for a "champion" of the area, though none were sure precisely whom that might be. Still, when asked if they felt encouraged about the future of Shaker Square, nearly everyone raised their hands.